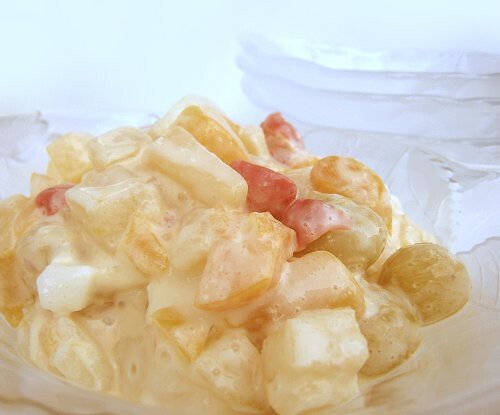 We usually end our Filipino-inspired gatherings with Mama's Philippine-style Fruit Salad. This is an extremely popular item among our guests. My mother is always in charge of this dessert and I always know that she has finished making her fruit salad by the number of colanders out and near the sink. For a seemingly-simple recipe, my mother uses quite a lot of implements. Or actually, she just really likes using colanders. LOL. This really is super-simple to make; it's a matter of assembly. One needs only 3 items. One, canned thick cream. 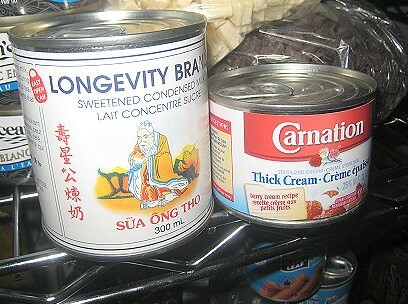 Yes, canned cream. Then, condensed milk. I heart condensed milk! The third component, the fruit portion of this dish, is canned fruit cocktail. We prefer using canned "Fruit Cocktail", as opposed to "Fruit Salad", or "Tropical Fruit", or "Fruit Mix", or any other such things. Yes, there is a difference! The USDA actually regulates "fruit cocktail", listing the correct percentages of which fruits go into canned "fruit cocktail". My mother also likes to supplement fruit cocktail with toddy palm. These also come canned. If they are whole, she slices them. If they come sliced, then she saves herself some work! 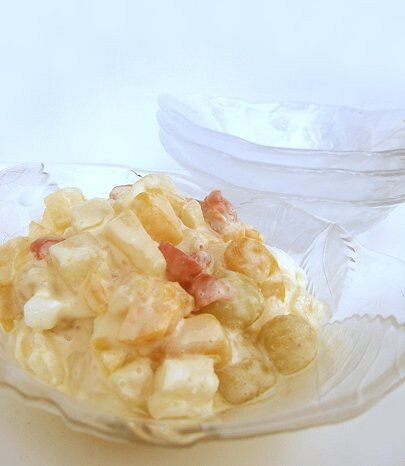 I also like extra macapuno (meat from "mutant" coconuts) in fruit salad, but Mama doesn't like them for some reason, and thus, never adds them to her fruit salad. 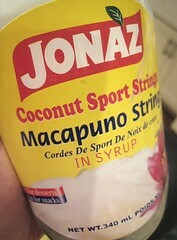 Learn more about macapuno (mutant coconut) in our Lime Macapuno Bar post. But, fruit cocktail with toddy palm is my mother's classic combination. To make Mama's Philippine-style Fruit Salad, simply open your cans of fruit cocktail and toddy palm and drain. Although, I don't know why Mama has to dedicate one colander for the fruit cocktail and one for the toddy palm. Why not put both things in one colander? If your toddy palm is whole, you may want to slice them first. If using other canned fruits, drain them as well. Then, open your canned cream and your condensed milk, and mix everything together. This goes into the refrigerator until the end of dinner. Mama always makes this recipe enough for one platter for the party and a take-home box for one of our guests, much to everyone else's resentment. "How come he always gets his own personal stash of fruit salad!?!" This is Mama's preferred combination of fruits and cream/milk. Feel free to adjust fruit levels, creaminess levels and sweetness levels according to your tastes. This is half the amount Mama would prepare for a party. Drain canned fruit cocktail and canned toddy palm well. If whole, slice toddy palm. If using other fruits, prep them: cut into pieces; drained canned fruits, etc. 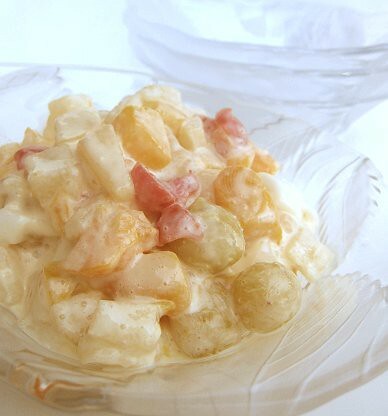 Mix together drained fruits with condensed milk and cream. Cover and chill for at least 2 hours (make sure the dish is well-chilled). Mix/stir right before serving. When I was in Bacolod last December, I had an even better version. A family friend makes it with 1 block (I guess 250g?) of cream cheese and 1 can of condensed milk! Blend the two together, then add to the fruit. I thought it was even better than the canned cream version because the cream cheese adds a bit of tartness that cuts through the sweetness of the condensed milk. Will have to try it with the addition of our family secret of Kahlua! My mama used to make this for Christmas noche buena back when we were kids in Binondo. She would add diced apple and mayonnaise to the mix and sometimes grated cheese. When I make it here in Canada I also add about half a cup of mayo and I omit the condensed milk. Re: using a number of implements, for example: colander -- Just like Dad.. Should I say, like sister, like brother? 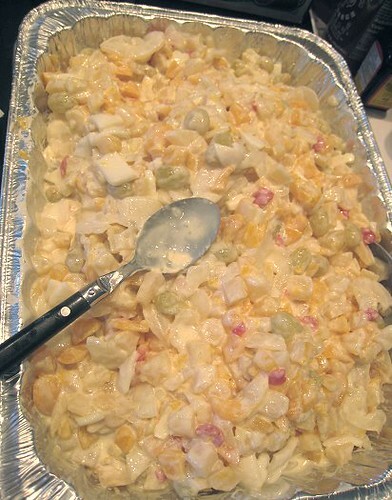 Hahahha..
this looks a lot similar to a dish my godmother used to make around holiday time called ambrosia. i couldn't get enough of it! I remember fruit salads made out of these cans of fruit cocktails while I was growing up, minus the milk and cream cans; these we thought were the best. actually; adding the milk and cream sounds even better! I have seen this version with corn and grated cheese. A lot of people i know also likes to freeze it and eat it semi frozen. Haha, I know, unfair is right. The apple and cheddar sound good! Hahaha, I know. Although, I think Mama has a special relationship with COLANDERS. Teehee. Oh, I've heard of that! My favorite part is the PEACHES. And the pears too, actually. Add pineapple to that, then yum. Hey -- nata de coco is supposed to be good for you! For real! As long as it's the canned one, then the all-purpose cream is probably the same thing.